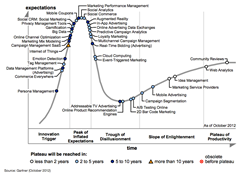 Elastic Path Software, the digital commerce company, has been cited as a sample vendor in the Gartner “Hype Cycle for Digital Marketing, 2013” report. Elastic Path Software, the digital commerce company, today announced that it has been recognized in the Gartner “Hype Cycle for Digital Marketing, 2013” report. Elastic Path was named in the Commerce Everywhere category, alongside Adobe, Amazon, Facebook, and IBM. Last month, Elastic Path announced the immediate availability of Commerce Engine 6.7 and Cortex 1.7, the world’s most powerful software for monetizing digital experiences in ways that are native to the customer’s context. These groundbreaking software applications deliver on the promise of commerce everywhere by eliminating the technical barriers that prevent marketers and CMOs from easily leveraging ecommerce in digital experiences beyond the storefront, such as apps, consumer electronics, and APIs. To learn more about Commerce Engine and Cortex, visit http://www.elasticpath.com/ecommerce-solutions/. Elastic Path builds ecommerce software that powers the next generation of digital experience. We help businesses maximize revenue from their goods, services, and content with solutions that empower companies to create outstanding customer experiences that drive engagement and conversion. Elastic Path technology brings this functionality to multiple touchpoints – websites, apps, APIs, and more – while generating a single view of the customer. Market leaders, including Google, Pearson, Symantec, Time Inc., and Virgin Media, use Elastic Path to drive billions of dollars in digital ecommerce annually.